This is a fundamental data provider for Wealth-Lab version 6 and up that downloads free fundamental and economic data items from the YCharts web site. The full set of data is available to YCharts paid subscribers only. Note: free trial may not qualify and you won't get any data. However, many fundamental items are downloadable for free even if you don't have a subscription. 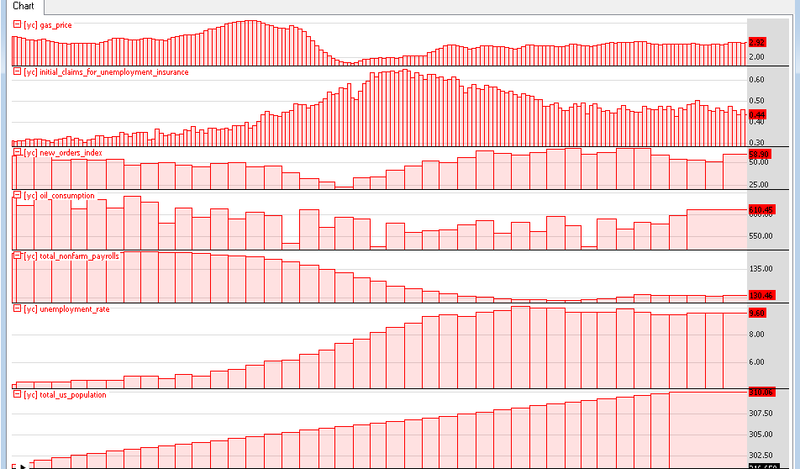 YCharts restricts free fundamental data to the last 2-3 years. Economic data is available to paid subscribers only. To start collecting 75+ fundamental items and 15+ economic data items provided by YCharts, check the provider's entries in Wealth-Lab's Data Manager tool (at the bottom of the "Update Data" tab). Now, Wealth-Lab will also collect fundamental data for all symbols and/or economic data after it finishes updating static data. Starting from v2015.03 the provider supports retrieving data through the official Excel Addin API. 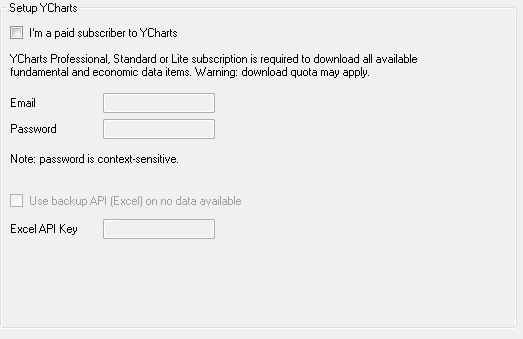 Should the usual web downloads broke, you can paste in your Excel API Key (available in your Profile on YCharts website) and switch to the backup way. Fundamental data downloads are available when you click "Update all data..." (and have at least one data provider selected from the list of installed provider) or when "Update DataSet" is selected. Note: Fundamental items aren't collected when "Update DataSet (Pricing)" is selected. Be patient while the provider is downloading the data. Although data downloads are multi-threaded, it could be a lengthy process for large portfolios. Since new fundamental data items become available every 3 months, it's recommended that you uncheck the provider's entry in the Data Manager for daily updates! If you fail to do it, you will quickly run out of the monthly quota (which is only 25MB for the cheapest plan). Alternatively, switch to the limited free download mode. Economic data items are updated only when "Update all data..." was clicked. Downloading this data does not depend on selected data provider, as economic items are global by nature and don't belong to a symbol. Please be patient while the data is downloaded (may take a minute). Price-To-Book Ratio = Close / "[yc] book_value_of_equity"
P/E Ratio = Close / "[yc] eps"
Market Capitalization = Close * "[yc] shares_outstanding"
P/EG Ratio = (Close / "[yc] eps") / "[yc] eps_growth"
Wealth-Lab customers can request new items from YCharts extensive collection here: Forum support thread. Fundamental items can be charted from the Fundamental Data dialog at any time by clicking the Fundamentals button in the Navigation or Function toolbars, from the Tools menu, a chart's right-click menu, or simply using the Ctrl+U shortcut. The data are refreshed on each update (like other WL6 fundamental data providers do), so it should be free from adjusting problems. This consumes quota. If some economic items didn't appear after downloading, try repeating the data update.